In the heart of baseball season, NASA completed its equivalent of a clean inning, successfully testing the third RS-25 flight controller for use on the new Space Launch System (SLS) deep space rocket. Engineers conducted a 500-second test of RS-25 Engine Controller Unit No. 5 on the A-1 Test Stand at NASA’s Stennis Space Center near Bay St. Louis, Mississippi, July 25, 2017. The test involved installing the controller unit on an RS-25 development engine and firing it in the same manner, and for the same length of time, as needed during launch. With this latest test, NASA continues to set the stage for deep-space exploration missions, achieving another milestone toward launch of the first integrated flight of SLS and the Orion spacecraft, known as Exploration Mission-1. SLS will be powered at launch by four RS-25 engines, firing simultaneously to provide 2 million pounds of thrust and working in conjunction with a pair of solid rocket boosters to produce up to 8 million pounds of thrust. The four RS-25 engines for the initial flight are former space shuttle main engines, modified to perform at a higher thrust level and with new controllers. The controller is the key modification to the engines and is characterized as the “brain” that provides precision control of engine operation and internal health diagnostics, and allows communication between the RS-25 engine and the SLS. During launch and flight, the controller communicates with the SLS flight computers, receiving critical commands and returning engine health and status data. Early tests at Stennis provided critical data for development of the new controller by NASA, RS-25 prime contractor Aerojet Rocketdyne and subcontractor Honeywell. NASA tested the first flight controller on the A-1 Test Stand at Stennis in March. The second flight controller was tested in May. Following review of test data, both controllers were designated for use on RS-25 engines that will power the SLS launch. 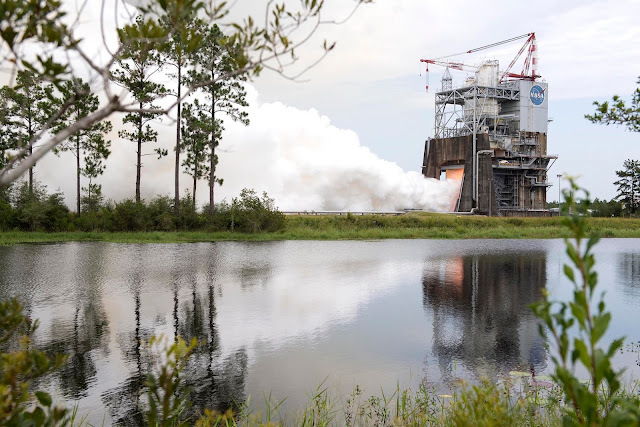 RS-25 tests at Stennis are conducted by a team of NASA, Aerojet Rocketdyne and Syncom Space Services engineers and operators. Aerojet Rocketdyne is the RS-25 prime contractor. Syncom Space Services is the prime contractor for Stennis facilities and operations.